Purple's story starts in 1996 with the company's incorporation in Singapore to service clients like the Marina Mandarin Hotel, the Mandarin Orchard Road and the Hotel Istana in Kuala Lumpur. Our core area of expertise is in strategy and the holistic integration of all aspects of the branding mix to develop effective and long-lasting brands. We have developed a unique range of tools and techniques as we’ve refined our methodology along the way. Clients benefit from our clarity of thinking. We insist on getting to the root of strategic issues before talking about execution. We have completed projects for many of Asia's leading brands. MNC Group's purchase of ICB Bumiputera Bank meant its rebranding as MNC Bank. We worked with a team of specialists to position the new brand, create a complete Brand Platform and oversee Brand Identity, Brand Communications and Brand Engagement. This told the story of Smart's achievements to date as well as its vision of the brand's future. It galvanised the company to new heights of success as the programme was cascaded throughout the country. 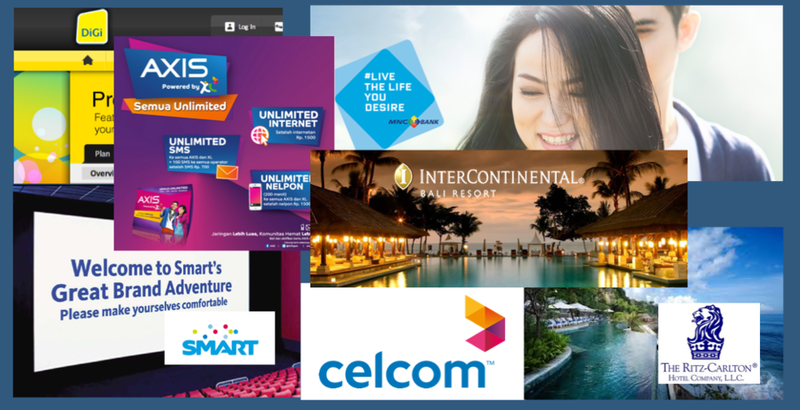 T-CASH is to operate as a brand separate to patent Telkomsel and working with our business partners we developed a brand strategy for the new venture. OK! Bank Indonesia was bought by a Korean financial services group and working with our business partners we developed a brand strategy to reposition the brand in Indonesia's highly competitive financial services market.